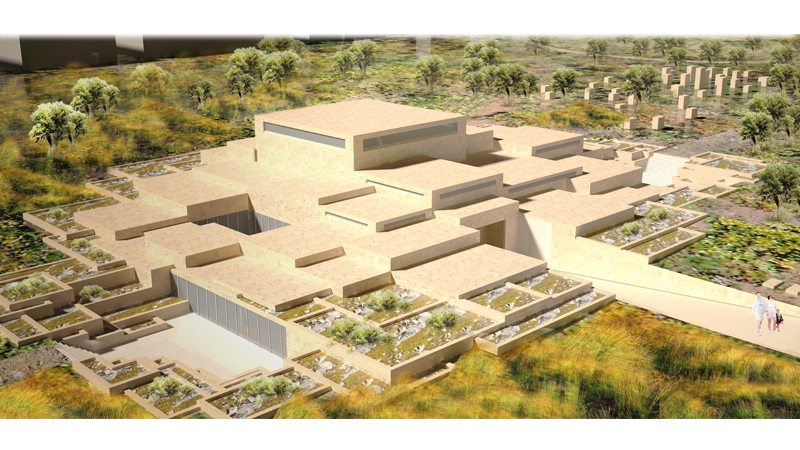 Plan of the mausoleum and museum is based on two main axis. The first one is ceremonial axis which connects ceremonial ground and the mausoleum. The Second one is social and service axis which create connection between park and indoor. Cafe, auditorium, atelier, library are located on this axis. Monumental tomb is designed to make the visitors feel that they are visiting a symbolic leader. His personal belongings, his life and his struggle in Cybrus conflict is narreted by this museum and monumental tomb. Ceremonial promenade creates an axe between mausoleum, ceremonial ground and tmt monument where activities are concentrated in special occasions. Entrance of the museum and mausoleum is 2m under the ground level. The room creating darkness at the entrance and narrowing the entrance hole narrates the death to the visitors. Lofty entrance and illuminated indoor spaces following dark room before entrance space and the eaves is a symbol of life after death. Increasing the light and volume of the mausoleum emphasizes his greatness.